Earlier this morning Apple introduced its next-generation MacBook Pro equipped with a Retina Display. The 15.4-inch panel features a native resolution of 2880 x 1800, or exactly four times the standard 1440 x 900 resolution of a regular 15-inch MacBook Pro. As we've seen in the past however, an ultra high resolution screen in a small form factor can make for some very difficult to read text. 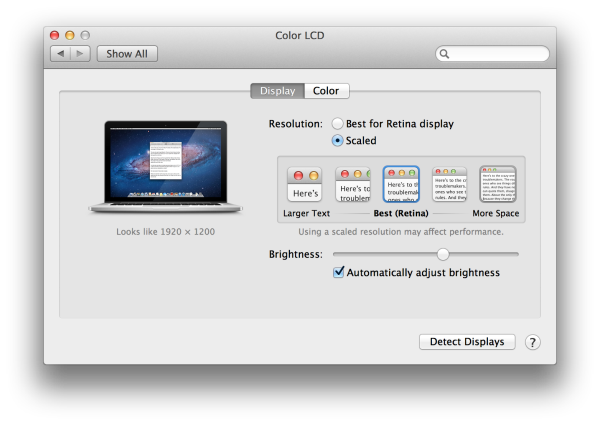 The Retina MBP ships with a version of OS X Lion however that supports a number of scaling modes to take advantage of the ultra high res display. Apple offers five scaled settings including the default pixel doubled option: 1024 x 640, 1280 x 800, 1440 x 900, 1680 x 1050 and 1920 x 1200. Selecting any of these options gives you the effective desktop resolution of the setting, but Apple actually renders the screen at a higher resolution and scales it to fit the 2880 x 1800 panel. As a result of the upscaled rendering, there can be a performance and quality impact. It's also worth noting there's no default option for 2880 x 1800, which is understandable given just how tiny text would be at that resolution. I suspect it won't be long before users figure out how to manually add a zero-scale, 2880 x 1800 option. The gallery below shows the impact of these scaling options on desktop area as well as how much of the AnandTech front page you can see at each setting. I never knew the MBP remains a 16:10 Ratio! Why do they not used 16:10 on iMac as well? The 16:10 panel in that size class (2560 wide) in IPS is a 30" which still costs (as a standalone display) roughly double what 27" 16:9 screens cost. The old Apple 30" Cinema Display was one of those.